Pictures images and photos of the late Roman Byzantine Chora Church, Holy Saviour, mosaics 1315-1321 ( now Kariye Museum ). Originally outside the original city walls built by Emperor Constantine The Chora Monastery derives its name from the Greek Kariye meaning country or suburban area. In 413 AD Emperor Theodosius built new land walls and the Chora monastery lies just inside these. Devastated by an earthquake on October 6 557 a new basilica was built for the monastery by Emperor Justinian. The occupation and sacking of Constantinople by the notorious Forth Crusade in 1204 lucky left the Chora untouched but due to neglect under the Latin occupiers it fell into poor repair. Theodore Metochites ( 1270–1332 ) was a poet and humanist scholar during the reign of Andronicus II. Son of the archdeacon George Metochites who was condemned to exile for his fervent support of the union of the Orthodox and Roman Catholic church. Theodore Metochites was an academic being versed in literature & science, writing poetry in high Greek that is still difficult for academics to translate. Metochites’ political career culminated in 1321, when he was invested as Grand Logothete. He was then at the summit of his power, and also one of the richest men of his age. Metochites restored the Chora adding an outer Narthex and adorning the ceilings with sumptuous mosaics and frescos between 1315-1321. Being an early Humanist the style of the frescos introduces Human emotions and depictions of "real" people over the purely spiritual rules of depiction adhered to by the Orthodox Icon painters of the time. In 1332 in the west Giotto was still painting static unemotional frescos at the same time as the Anastasis ( resurrection) fresco of the Parecclesion chapel in the Chora was being painted. It depicts Christ saving Adam and Eve by resurrecting them from their sarcophagi. The fresco is full of movement with Christ all powerful in a pool of light at its centre. It has often been asked how western art went from the two dimensional lifeless paintings of Giotto to the full glory of Renaissance painting and sculpture in such a short time. The art of the Chora shows the conduit that saw Byzantine academics reveal Humanist ideas and the sciences of the old Greek Classical world to a Western Europe that had forgotten them after the fall of the Roman Empire and a period when academic pursuits stopped. 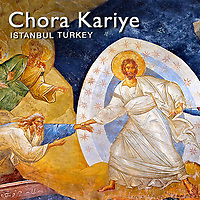 The art of the Chora still has to conform to Orthodox beliefs of iconography of the time so could not go as far as later western Renaissance religious painting. How far the Byzantines would have gone will never be known because Constantinople fell and the Empire was extinguished in 1453. Under the rule of Andronicus III Metochites fell out of favour and spent the last years of his life as a monk in his beloved Chora Monastery.